When cutting material with a laser, a nominal amount of excess laser power must pass beyond the lower surface of the target material to ensure a complete cut. On a standard laser material support surface, this excess laser power can damage the lower surface of the target material as it reflects off of the support surface. The ULS Flow-through and Configurable Cutting Tables minimize the supporting surface for the target material, preventing damaging back-reflection as well as allowing laser cutting byproducts to be more effectively removed. Mitigates or eliminates laser damage to lower surface of target-material being laser cut. Precision-levelled table provides a path for excess laser power and for laser processing byproducts to escape. Expands the range of materials which are compatible with laser processing. The Flow-through Cutting Table consists of a thin-wall aluminum honeycomb-core evenly supported by an underlying hollow structure. The target material is placed on the honeycomb core. When excess laser power passes the lower surface of the target material during a laser cutting process, this excess power is passed into the supporting structure where it is absorbed in an unfocused state. Where the excess power passes over the honeycomb core edges, a minimal amount of laser power will be reflected onto the bottom edge of the target material, which may manifest as a small periodic mark on the bottom of the laser cut edge. For the majority of applications, this periodic mark is not noticeable and is not a concern. In cases where these marks are undesirable, the ULS Configurable Cutting Table can be employed. The Configurable Cutting Table consists of an anodized aluminum plate with an array of precision holes spaced at regular intervals. The operator may insert specially designed material-support pins into these holes in an arrangement that fully supports the target-material while avoiding the cutting path of the laser completely. The result is zero back-reflection onto the lower surface of the target-material while maintaining full material support. 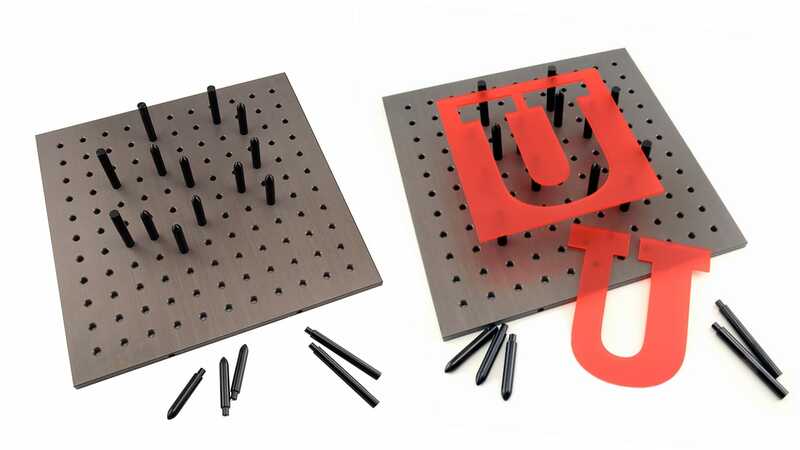 The material support pins sufficiently space the target material above the anodized plate so that the out-of-focus excess laser power exiting the bottom of the target-material is fully absorbed by the anodized plate. The supporting structure for the honeycomb-core of the Flow-through Cutting Table is precision-leveled to the laser beam delivery system, resulting in consistent focus and cutting throughout the laser processing area. 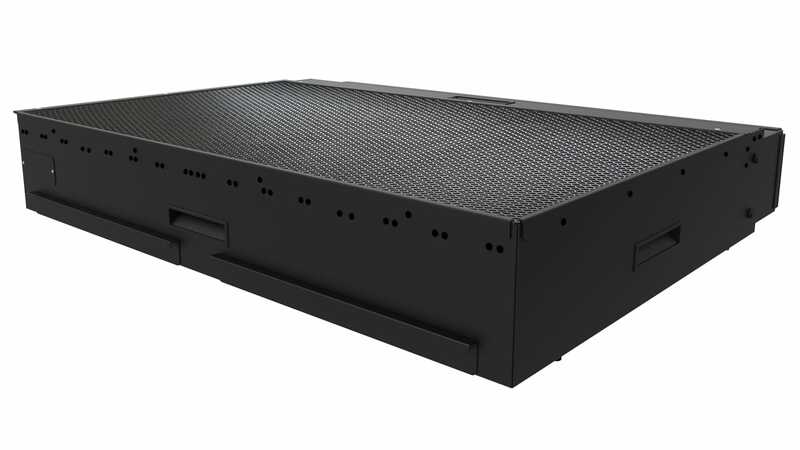 Unlike our competitors, the ULS supporting structure is ducted to the exhaust plenum of the laser system, allowing laser cutting byproducts to be efficiently transported away from the target material and out of the laser system. Furthermore, the negative pressure generated inside the supporting structure by the exhaust flow allows a nominal amount of material hold-down force to occur (when properly masked), further enhancing the consistency of cut across the target material. Nearly all laser cutting applications benefit from coaxial gas-assist. With a standard, solid laser processing support surface, it is not possible to use coaxial gas assist for laser cutting processes as the pressurized gas introduced at the focal point of the laser beam can flow under the target material and lift it off of the supporting surface. The honeycomb-core material allows the coaxial gas and laser cutting byproducts to flow into the structure of the cutting table where it is carried out of the system through the ducted exhaust plenum.